Fire Resistant Boards - Fermacell, Versafire, Versapanel. Fermacell, Versafire and Versapanel are common solutions when the situation demands stability, inert or fire resistance. 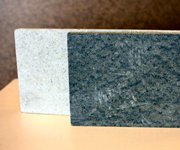 We stock mineral building boards in a selection of sizes. These three products, Fermacell, Versafire and Versapanel have a number of different applications. This might be when a firewall needs to be constructed in a building project or perhaps an area is to be prepared for ceramic tile fixing in a shower enclosure. Avon Plywood stock Fermacell for use as the tile backing board when tiling a wall in a shower or as a splash back area in a kitchen. Versafire is ideal where there is a need to create a firewall or an enclosure around a Boiler or Major Electrical Installation. Versafire fits the bill. Versapanel is suitable for general building work where an inert board is needed such as soffits or even as an acoustic barrier. Versapanel would be a good choice.